3-on-3, on "rotate", defenders X4-X5-X6 rotate clockwise to new matchups, coach passes to shooters 2 or 3 for a shot, offensive rebounders 4-5-6 must get three rebounds before the defence gets five rebounds, or they go again with three new defensive rebounders. Offensive rebounders must anticipate the shot, initiate contact, and go the glass. 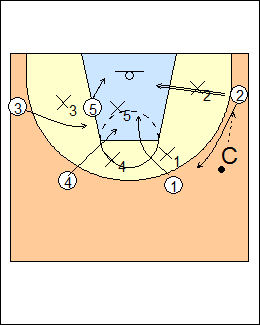 Nancy Fahey (WBCA) - Circle box out - defenders rotate clockwise, calling out who they are guarding, coach shoots from a wing when they are between attackers and the basket, variation - as defenders are circling clockwise, coach calls "switch", they rotate counter-clockwise. 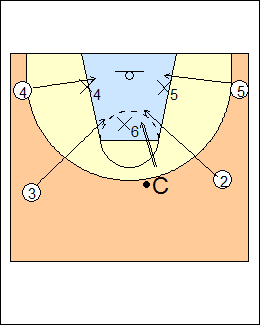 See Rebounding - Single-bubble, Florida circle the wagons, Doc's drill. 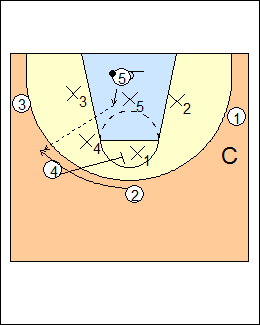 X6, repeat until the offensive rebounders get two in a row, switch. 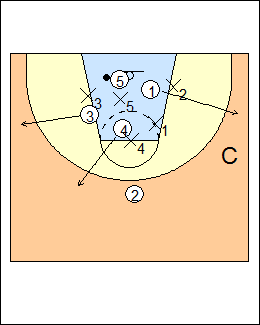 See Rebounding - Illinois war, Illinois 4 on 3. 5-on-5 (4-out 1-in set), coach passes to any perimeter attacker for an uncontested shot, the shooter rotates to the top of the key as safety, all other attackers offensive rebound and initiate contact with defenders. 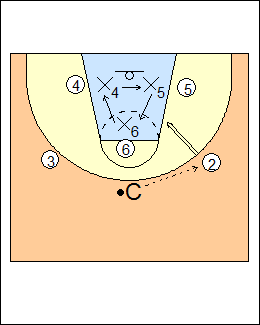 See Rebounding - 5 on 5 box out. On an offensive rebound, other attackers sprint to the perimeter for a pass. If there is no immediate kickout, perimeter players laterally screen for a preferred shooter while the ballhandler improves his position to make a pass.